Below you will find NSCA CSCS Examination Content Review from select chapters of the text Essentials of Strength Training and Conditioning. They are provided in PDF format. 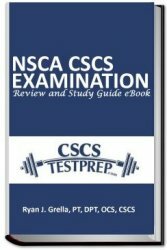 For a content review of all 24 chapters of Essentials of Strength Training and Conditioning, please consider the NSCA CSCS Examination Review and Study Guide eBook. In addition, this eBook contains a total of 550 multiple choice practice questions, two simulated practice tests, and various other features. To learn more about this study guide, please click here.